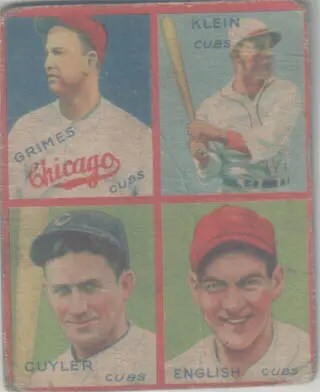 That’s about what I paid for my second 1935 Goudey card, which featured not one but three Hall of Famers in Chicago Cubs uniforms: Burleigh Grimes, Chuck Klein, and Kiki Cuyler, along with Woody English. And when I bought that card in the late 1980s, I knew none of them were going to have a bad year the next year. The card was a low grade, somewhere around fair or good condition depending on the grader, which was why it was so cheap. But it was more than 50 years old and while all of the players featured are low-tier Hall of Famers, they’re still Hall of Famers. It’s worth about four times that now. Burleigh Grimes was the last of the legal spitball pitchers. He played 19 years and won 270 games, and 1934 was actually his last season in the majors, so this is a farewell card of sorts. He had last played for the Cubs in 1933 and never played a game for the Cubs in 1935, but including him on this card gave the card three Hall of Famers, so I won’t complain. Goudey was known for rounding out sets with questionable players; this one happened to be a questionable player who was inducted into the Hall of Fame in 1964. Chuck Klein was a slugging outfielder for the Pirates and Cubs. The previous year, Goudey had revised its famous “Lou Gehrig says” tagline on its 1934 cards to include Chuck Klein’s commentary on other players in an effort to boost sales in midwestern and National League cities, where Klein perhaps had more appeal than Gehrig. He was elected to the Hall of Fame in 1980. Kiki Cuyler was the kind of guy you liked having hit ahead of Chuck Klein, because he had good speed and got on base a lot. A career .328 hitter, he stole 328 bases and led the league in stolen bases four times. He was elected to the Hall of Fame in 1968. Woody English was the fourth player on the card. He had been an All-Star as recently as 1933, had been the Cubs’ leadoff hitter and team captain, but he missed much of the 1935 and 1936 seasons due to injuries. He re-emerged as a starting shortstop in 1937 with the Brooklyn Dodgers but was essentially what we now call a replacement-level player. The Dodgers waived him in mid 1938, and he bounced around four teams in 1939 but didn’t get into any major-league games with any of them. My card’s back story: Even in the 1980s when the prices of modern cards were through the roof, many vintage cards were affordable. In lower grades, even a teenager could afford them. The trouble was finding them. There was one card shop in the small town I lived in, but they rarely had anything more than about a decade old. To get vintage cards, you had to go to St. Louis. The shops in St. Louis were good enough that four of them had been featured in one of the monthly baseball card magazines, but the best was World of Baseball Cards, on Lemay Ferry Rd in south St. Louis County. The owner, Thomas Brady, died in the early 1990s and the store closed soon after. He charged higher prices than the other well-regarded stores–you would pay current book value there, unless the previous month’s or year’s book value happened to be higher–but if you wanted old cards, especially pre-war cards, his store was the place to go because he had more of them than anyone else in the area. And he did have a bargain board, where he would tack up damaged cards of notable players to try to move them fast. A kid like me couldn’t afford 1950s Mickey Mantle cards in high grade, but I remember picking up a 1959 Mantle in low grade for $10. I doubt any of the other kids I knew had any Mantle card at all, aside from perhaps the one from the infamous 1982 Kmart set. This 1935 Goudey was one of many low-grade Hall of Fame cards I picked up at World of Baseball Cards. There’s no telltale thumbtack hole in its toploader, so the card probably came out of Brady’s glass case due to its age. Dad and I would spend a Saturday afternoon in Brady’s store a couple of times a year. Even after we moved to the St. Louis area, Brady’s store was a decent distance from where we lived, so we never became regulars there. As for what it was like in those days, this Economist article is an honest account from someone close to my age. It gets a couple of details wrong but the overall message is pretty much spot on. The cards I was pulling out of wax packs in those days haven’t aged well, but the stuff Dad and I bought out of glass cases has done more than hold its own. It provided a valuable early lesson for me.